In this video we will discuss the difference between rows and range in SQL Server. This is continuation to Part 116. Please watch Part 116 from SQL Server tutorial before proceeding. Let us understand the difference with an example. We will use the following Employees table in this demo. The following query calculates the running total. We have not specified an explicit value for ROWS or RANGE clause. This means the above query can be re-written using an explicit value for ROWS or RANGE clause as shown below. 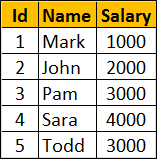 To understand the difference we need some duplicate values for the Salary column in the Employees table. Now execute the following query. Notice that we get the running total as expected. You get the following result when you execute the above query. Notice we don't get the running total as expected. So, the main difference between ROWS and RANGE is in the way duplicate rows are treated. ROWS treat duplicates as distinct values, where as RANGE treats them as a single entity.